New fund offerings (NFOs) might not be a good option to invest in. An FE study of 428 open-ended equity schemes found that about 50 or 12% of them are currently quoting below par. Equity schemes have an offer price of R10 and net asset value (NAV) of many schemes were found to be below R10. Many NFOs were launched in the past amidst heavy marketing promotions, out of which some also made good collections from investors. Mahesh Patil, head Of equity-domestic Assets, BSLAMC says, Some of the funds are quoting below par because their inception dates back to 2007 & 2008, when market sentiment was bullish and Sensex was quoting at higher levels. He added that since then the market has corrected sharply, pulling down the funds NAV. According to Value Research data, out of 41 mutual fund houses, the maximum number of schemes quoting below par were found to be with Reliance Mutual Fund (5 schemes) followed by L & T Mutual Fund and LIC Nomura Mutual Fund. Even in percentage terms, Reliance MF had maximum percentage (19%) of its equity schemes quoting below par. Among the 26 Reliance Mutual Fund equity schemes, the lowest NAV was registered in the case of Reliance Infrastructure Retail (R8.3 as on May 23). For the sake of the study, only growth schemes were taken since NAVs of dividends schemes wouldnt adjust for dividends paid to investors. Interestingly, a lot of infrastructure funds have taken a beating. 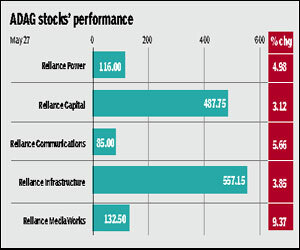 NAVs of infrastructure funds from Reliance, Kotak, AIG, L & T, Tata, Religare and Bharti were quoting below par. Stocks of Infrastructure companies have been taking a beating in the recent past because of the delays in government spends and in order implementation. Among the 50 below-par funds, the lowest NAV of R3.67 was registered in the case of JM Core 11 as on May 23 followed by L & T Small Cap (R4.8 ), Religare AGILE (R6.51), L & T Infrastructure (R6.65), JM Emerging Leaders (R6.99) and Religare AGILE Tax (R7.36). Recently, Sebi had made a mention of the flurry of launches being made by mutual funds without any major differentiation in investment strategy. Perhaps the above scorecard could make the regulator revisit its observation. Experts point out that some fund houses have been prudent enough to only launch schemes that made a difference. These include UTI MF, Franklin Templeton MF, DSP BlackRock MF and HDFC MF.